One of our projects that has been in the works since spring 2003, is filming the Common Loon (Gavia Immer). Our objective is to produce a documentary on the life and times from birth to maturity of this beautiful aquatic bird. This year 2004 will prove to be very challenging and exciting with some very crucial footage to be captured. Filming to this point has been a great success. Year 2004 was a difficult situation. Rain and high waters wiped out many of our Loon nests. Not to mention playing havoc with our crew. We did however manage to have some excellent encounters with our Loon families and capture them on film. Unfortunately the battle with high waters and predators put their eggs and young in dire peril, none survived. However a youngster from a foreign family managed to beat all odds and survived. After warding off a Snapping Turtle attack, the youngster hitched a ride with us for a brief moment before we reunited it with its parents. This in itself was a rewarding and memorable experience ! Working with these beautiful aquatic birds for over two years this was bound to happen. “Getting close to my subjects is my job, and usually no problem.” Trust and confidence (or maybe shear stupidity) seem to be my tools, however sometimes a small message is conveyed. This Loon just had enough of me and let me know it. Imagine my shock ! Unfortunately we did not capture the impact to my head, but just imagine the third photo if we had !! Some of the local people have constructed artificial Loon nests and have enjoyed the aquatic birds company for years. This type of construction is a floating paradise for the bird’s. It moves up or down with fluctuating waters which leaves only natural predators for a Loon’s concern. Year 2006 was a complete disaster. Again with water levels rising and falling and our Loon families paying the price. We had seen few nests with eggs and later on in the season no young. It definitely was a great disappointment to us and a devastating blow to our families. To add to the problem, as we approached one of the only nests with eggs a gruesome site was exposed. One of the adults was attacked and pulled from the nest only to be killed and bones picked clean. The mate was nowhere to be found, eggs abandon to feed again another predator. We could see this event was very recent. We have taken a educated guess feeling a large raptor was the culprit, due to how the carcass was found. Year 2007 what can I say but, AWESOME !!!. One soon becomes to realize as this filming project continues on, footage becomes more difficult to capture. With hours of time involved finding events one needs to complete the story becomes a grueling task of patience and perseverance. Some times wanting to throw all your equipment in the lake and go home. Then some force seems to work with you and that right place, right time factor comes in play. During our fist two outings of 2007 we came upon this factor. Capturing on film one of our couples building their nest, then another one of our couples building a nest then laying an egg. The excitement factor was so high I could barely film. Seeing and filming these beautiful birds year after year has given me a great appreciation what wildlife endures to survive. We continue on filming rain or shine to capture that rare footage to eventually share with you all. Year 2008. 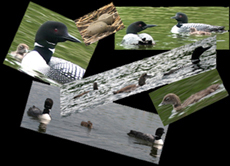 Unfortunately medical situations prevented us from filming our Loon families this season but we will return in 2009. Year 2009. Unfortunately again medical situations prevented us from filming our Loon families this season but we will return in 2010. Year 2010. Unfortunately again a persisting medical situation prevented us from filming our Loon families this season but we will hope to return in 2011. With some physical limitations we have resumed to film wildlife again. Pursuing many animals and birds. Including Deer, Fox, Raccoons, Owls, Grey Partridge, Squirrels, Hawks, Eagles, Falcons, Hares, Rabbits, Sharp-Tailed Grouse and several other birds & animals. To watch some still frame videos click on links below. Year 2014. We started research with The Kestrel Partnership and HD live stream of the American Kestrel Falcons. We are continuing this research at present time. See info and highlights, updates by clicking on link KESTREL KORNER which is below. We also started to film Coyotes which proved to be a great challenge and are still continuing today. Year 2015. A trip east led us to explore P.E.I. and New Brunswick, ranging from their wildlife to beautiful scenery. Year 2019. HERALD / FREE PRESS news paper article. CLICK HERE TO VIEW. Thank you Sheldon Birnie, community journalist The Herald. WE ARE STILL UNDER CONSTRUCTION. PLEASE BE PATIENT. THANK YOU.